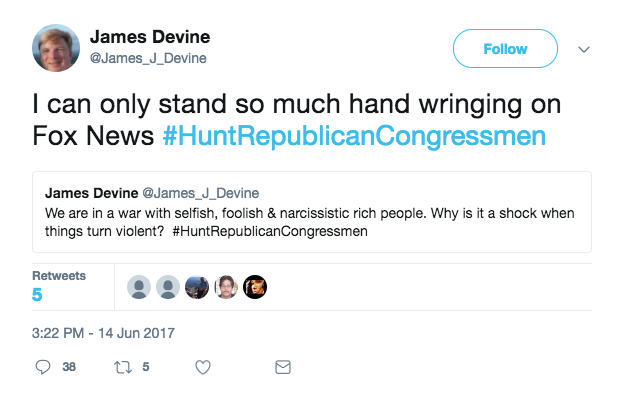 A New Jersey Democratic strategist and former mayoral candidate has created a “#HuntRepublicanCongressmen” hashtag campaign in response to the shooting of House Majority Whip Steve Scalise (R-La.) on Wednesday. 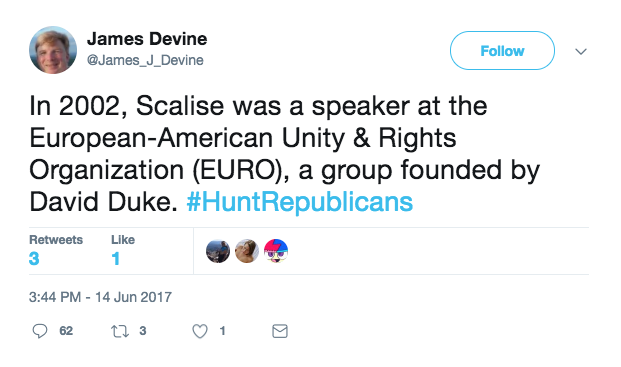 To support his lack of sympathy for Scalise, Devine claimed Scalise once spoke at a conference by a group called the European-American Unity & Rights Organization, which was started by David Duke. Scalise has since apologized for the talk, but other reports claim he was never actually at the talk. Devine accused detractors of being “snowflakes” and said Republicans have not engaged in civil discourse, citing the debunked story that Sarah Palin led to the shooting of Gabby Giffords. Devine defended his tweets in a statement to the Asbury Park Press. "Yesterday's events are the result of escalating rhetoric and vitriol that has been evident in our political system culminating with the election of our president and the chickens came home to roost, you know?" he asked. Devine told MyCentralJersey.com that the government is currently tyrannical and that the shooter on Wednesday was simply exercising his Second Amendment rights. After referencing a tweet by Republican Sen. Rand Paul (R-Ky.), Devine said, "Well, now that we have a tyrannical government, to use another Republican's words, James Hodgkinson is a citizen availing himself of his Second Amendment remedies." According to a previous report by NJ.com, Devine was once found guilty of shoplifting while running for mayor of Rahway. Devine has reportedly been involved in Democratic politics for 35 years. 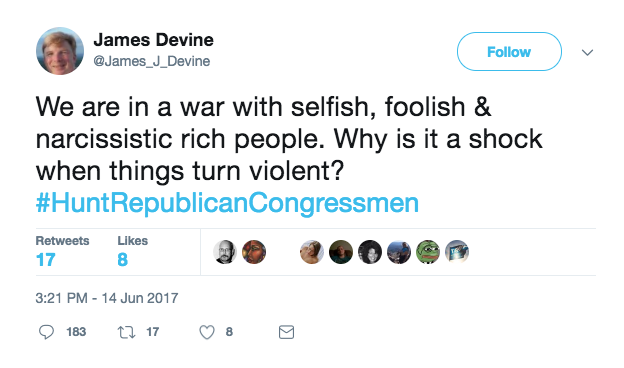 Like the shooter on Wednesday, Devine was also a vocal supporter of 2016 Democratic candidate Bernie Sanders’ presidential campaign.